In the mid-1980s a fragment of a stone knife and a number of small stone flakes were found in one of the lower layers of the site. Archaeologists recognized them as the product of Native people and suspected that they may have been made by the Beothuk. However, since none of the tiny stone arrowheads or other artifacts characteristic of Beothuk sites elsewhere in Newfoundland were found, no firm conclusions about the identity of Ferryland's first inhabitants could be made at that time. Yet, this changed when further site excavations were performed in later years. 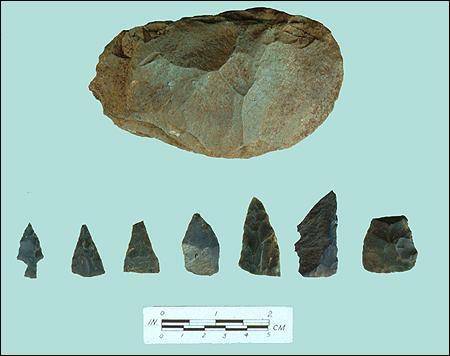 Archaeological excavations at Ferryland during the 1990s uncovered several small chert arrowpoints and a large chopper or blank. These artifacts were found in association with Beothuk hearths. When excavations were resumed in the 1990s, one of the objectives was to expose completely a stone forge discovered in the mid-1980s. When that had been completed, archaeologists continued to dig below the level of the forge floor, through layers of rock and refuse deposited by European visitors to Avalon. At a depth of more than 1.2 metres (3.9 feet) below the 1620s occupation they reached the original sand beach. To everybody's surprise the beach was littered with small fireplaces, made from locally-available cobbles piled in roughly circular concentrations up to a metre in diameter. Many of the cobbles were shattered into angular fragments as a result of being heated. The fireplaces contained quantities of wood charcoal, bits of discarded and burned food, bone and seeds, flakes from the manufacture of stone tools and, at last, some of the distinctive arrow points that were known from Beothuk sites elsewhere. No trace of wood-framed or semi-subterranean structures reported from other Beothuk sites was found; therefore the Beothuk occupation most likely consisted of a series of short-term visits by a small group(s) of hunters and, perhaps, their families. Mixed with the Beothuks' stone tools and refuse were sherds of pottery, obviously of European origin and dating from the first half of the 16th century. 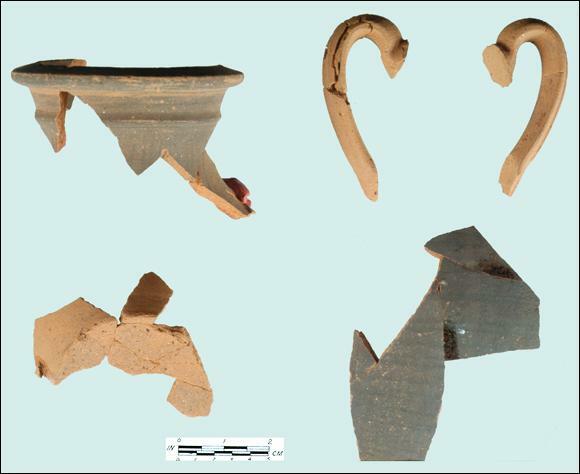 These fragments of a two-handled storage jar were found in the lowest layers of the dig. The jar, which was of Portuguese origin and known as "Merida-ware", was discovered in the same layer as the remains of the Beothuk hearths. It was broken sometime during the early 16th century. Because the European and Beothuk features and artifacts were in the same layer, the question of whether the groups ever met one another comes immediately to mind. We cannot answer this question with any degree of certainty, but the fact that some of the burned seeds from the hearths were those of grapes, not native to Newfoundland, suggests that the Beothuks may have obtained perishable items such as raisins from European fishermen, perhaps even in exchange for furs or some other New World commodity.